What’s better than 18 buttons on a gaming mouse? 19 buttons on a gaming mouse. 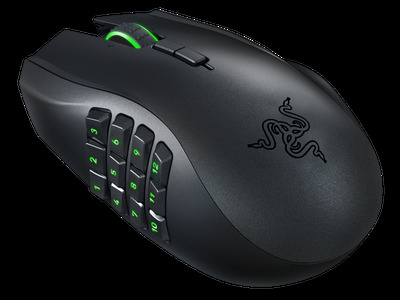 That’s how many Razer boasts on its new Naga Epic Chroma wireless gaming mouse, which is geared toward MMO players. In terms of hardware, its specs are pretty impressive: In addition to the 19 programmable buttons, the mouse has a 8,200DPI 4G laser sensor and 1,000Hz ultrapolling. That basically means it’s super precise and there’s virtually no lag. But the coolest part about the mouse is that you can program different lighting colours and patterns — 16.8 million combinations — to sync with your games and other Chroma devices, such as headsets and keyboards. The mouse isn’t cheap; it will cost around $US130 when it’s released next month. But that’s a small price to play for MMO players, who rely on their quick reflexes to win matches. Winning an MMO game, such as “League of Legends,” can bring in big bucks for its players. In fact a team of kids from Korea won $US1 million for doing just that. There’s even a “League of Legends” collector’s edition of another Razer mouse, the Naga Hex.